Available in a variety of shapes and sizes ideal for shipping goods for mail order companies to take out restaurants. Our die cut boxes are manufactured to various shapes and sizes and are used for many different things, they are cost effective and a quick solution for business or individuals. Whether you are a mail order company, an ebay seller or a take out restaurant we can provide you with what your requirements are. Boxes can also be custom made making sure that you can shipping out your products to your customers. 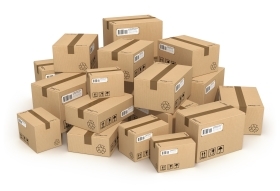 These boxes are ideal for many tasks including shipping small goods like DVD's, Books, clothes, electrical good and perfect for food deliveries including pizzas and all the while ensuring the safe arrival of the items. All our die cut boxes are supplied collapsed and bundled for easy storage and when required for use they are easy to assemble and there is no need for any glue or tape. All our boxes are manufactured using a high percentage of recycled material and once finished they are recyclable.